I'd like to interrupt your usual scheduling of Bloomly posts with something a little different - an outfit post! 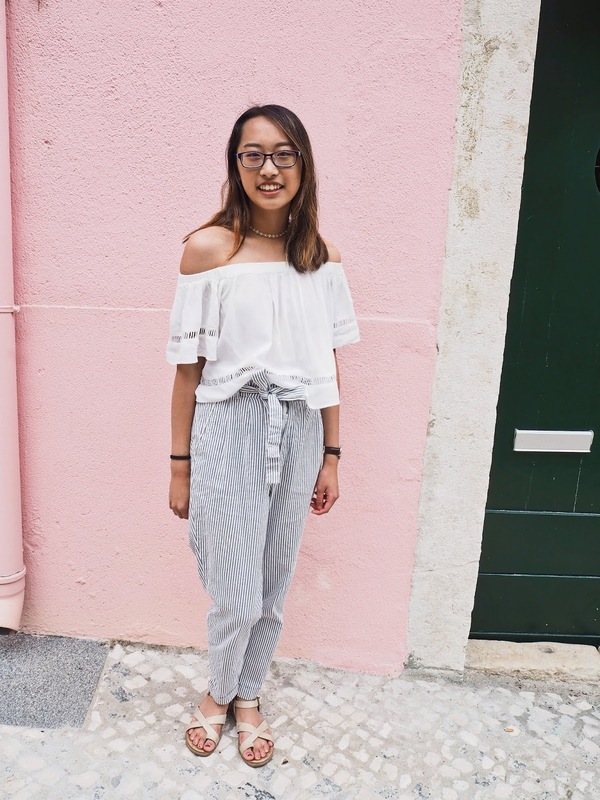 I usually don't do outfit posts, but I took these photos while I was in Lisbon and I LOVE them and I want to share them, is that too much of a crime? Looking at these photos, I was thinking, what do people do with all those cute photos that they take of themselves if they're not a blogger? I don't really post that often on my personal Instagram because I feel like it's obnoxious to post so many photos, especially my travel ones, because I feel like people only follow me because they know me in real life, not because they genuinely like my photos. I think that a really interesting thing about blogging is that people look at your content because they're genuinely interested in it. I do a lot of posts on the Bloomly on things meant to help you, posts that are applicable to your life. However, I want to also be able to include posts about me and things that go on in my life, and that's what this post is. I'm excited about these photos and I want to share them. I'm no fashion blogger, but it doesn't mean that I shouldn't get to share outfits and looks that I love. So if you're interested, go ahead and read. And if you're not, that's okay too. 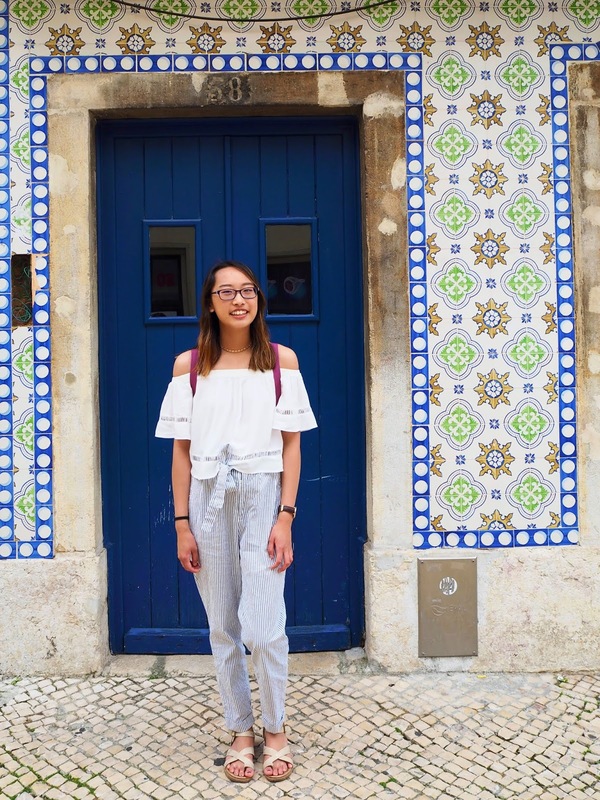 So these photos were all taken while I was exploring Lisbon, Portugal with my sister, which is the main reason why I like these photos so much, not only did I have a cute outfit, but I had the gorgeous backdrop of the city of Lisbon. We were looking for some pink walls to take photos in front of. 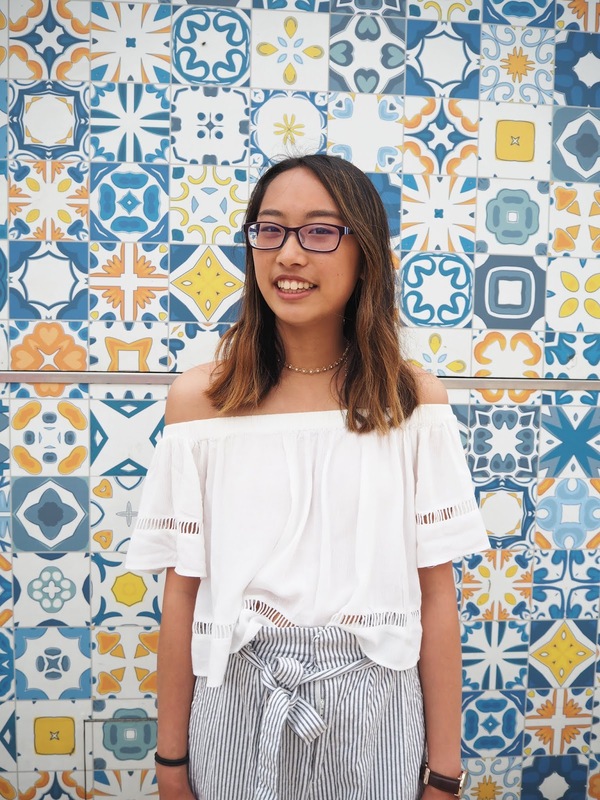 We ended up finding so many viable options (so Instagrammable!) and this wall above ended up being the best one. 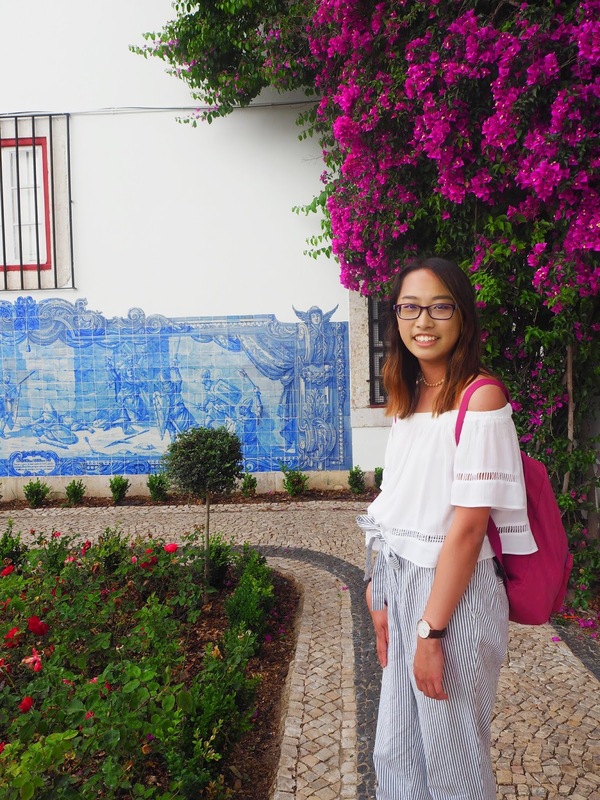 There were two Instagram goals: get a photo in front of some famous Portuguese tiles and a photo in front of a pink wall and they were both easily completed! Some context behind the photo above, it's a bit of a cheat, it was taken on a different day from all the other photos, in fact it was taken in an entirely different country! 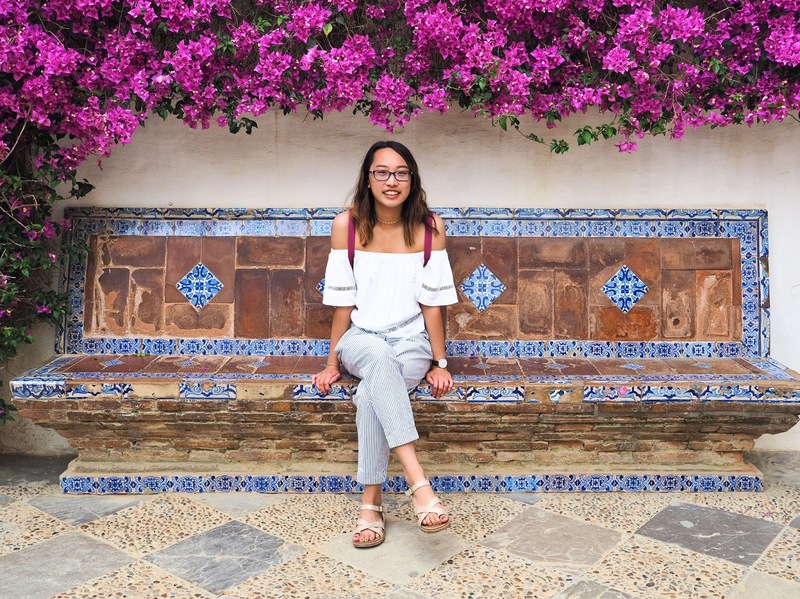 I took the photo above while in Seville, Spain, and I included it because it's another photo that I wanted to share with you all, (I mean seriously, the flowers and the tile bench are so cute!). So a little bit about what I'm wearing, I'm wearing this white off the shoulder top and these striped paper bag style pants. 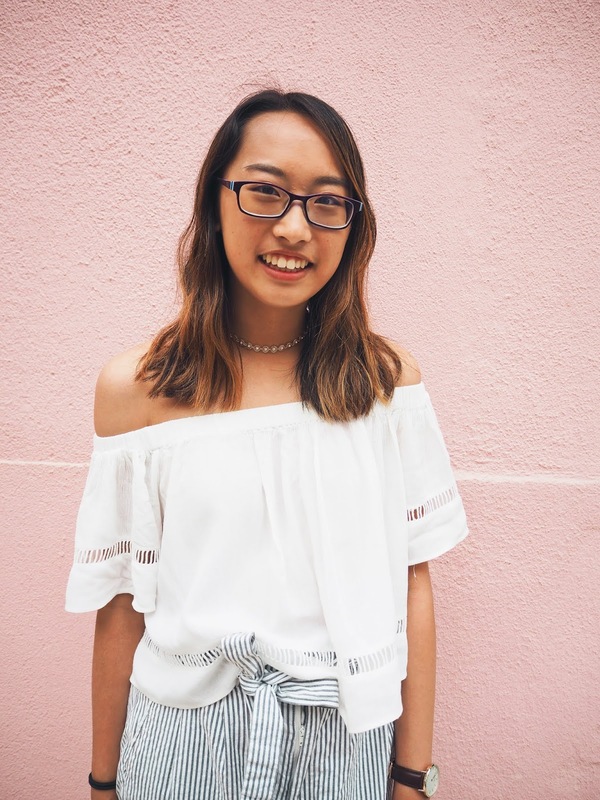 I love off the shoulder tops, but they are actually kind of uncomfortable. However, I think that the way that it makes me feel when I wear this kind of top is worth a little discomfort. I feel so good and confident when I wear this top and it just put me in a generally good mood. I paired this top with a choker, just to kind of fill up all that neck space. On top of that, I love these pants because they're comfortable and make me feel super stylish. They're high waisted, which is my favorite kind of pants, and they're really lightweight and good for the warmer weather. They're kind of like stylish summer sweatpants. The rest of the outfit is pretty conventional and less about fashion and more about function. The shoes are comfortable, they're comfort sandals. There's a little more about the comfort and the style of these shoes in my style spotlight post on comfort sandals. They were good for walking around and also good for the warmer weather. The watch can be fashion and function, on the trip it really served as function. I was trying to limit my phone usage while out to save battery (while we were in Lisbon we had a scare where we needed to catch the train early in the morning for a day trip to Sintra and our phones didn't charge overnight!) so I found myself relying more and more on my watch to check the time rather than my phone. The photo above is actually another cheat! 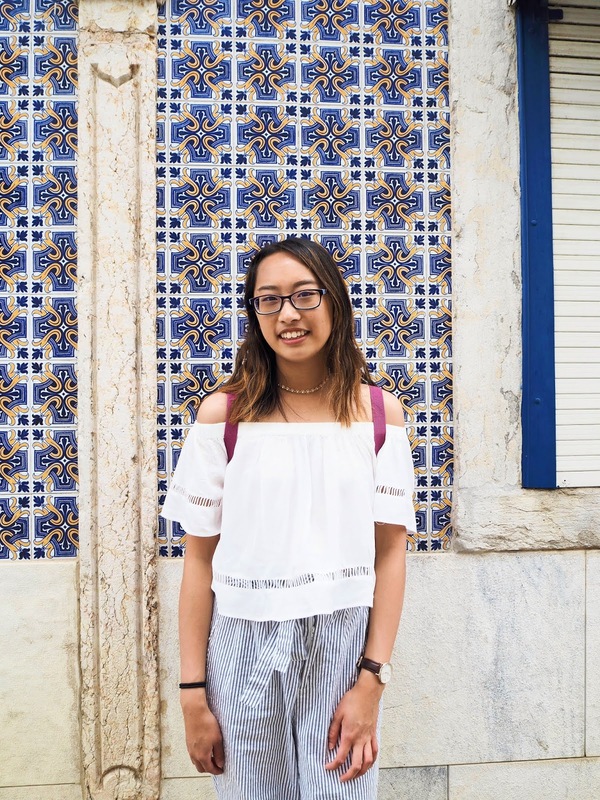 While it was taken in Lisbon, it was actually taken in front of a food truck rather than real Portuguese tiles. I got some weird looks and I posed in front of the side of a food truck, but it paid off because the photo actually turned out pretty great.